Ski jumping. Daredevils soaring from huge ramps. Olympic Ski jumping is going to be a premier event you will not want to miss. It has been around for 200 years. More popular now than ever. Away back in the year 1809 a Norwegian soldier by the name of Olaf Rye was showing off for his fellow army friends with his homemade skis. He set up a jump ramp on a hill and launched himself off for the great distance of just over 9 meters (30 feet). This daredevil feat gained him the distinction as the first recorded ski jumper ever. By 1862 others such as Sondre Norheim were attempting much bigger jumps causing them to travel longer distances and engaging in official ski jumping competitions. Every technique was attempted to gain more distance. We here in North America really do not have a great understanding of just how popular ski jumping is in the northern part of Europe. I remember in 1956, while serving in the Canadian Navy our ship took us to Norway. We paid a courtesy visit to a small city called Trondheim. It was situated up a beautiful Fjord flanked by huge mountains. One Saturday it seemed the population of the whole city hiked up into the mountain to the high wooden constructed ski jump. Just to see it. They were so thrilled to be there. 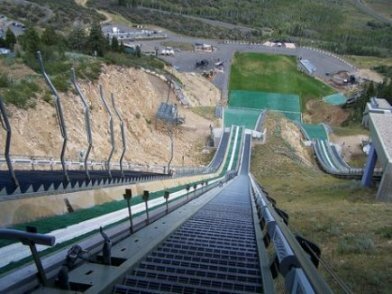 The photo above is a ski jump as it looks in summer. Undressed of it’s winter blanket of snow. 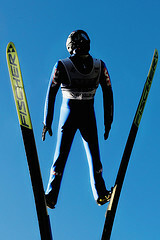 The style used today is a radical change from the earlier forms of ski jumping. A Swedish jumper by the name of Jan Boklov came up with the idea of the V-shaped position instead of the parallel. While in the air the skis are held in that V-position allowing the skis to create 28% more lift than the old way. At first he was laughed at and ridiculed, in fact Boklov was penalized, but finally once everyone changed over and now it is the accepted style for jumping. Men’s ski jumping was first introduced to the Olympics in 1924 in Chamonix during the first Olympic Winter Games. In 1964 the large hill competition had it’s start in Innsbruck. Technique is what it is all about. Speed yes but the timing is critical. The athlete skis down the long ramp building up speed to 95 km per hour. Once he leaves the ramp, the skier assumes the V-Style airfoil and tweaks his position to gain the maximum lift. The landing is held off until the last possible moment. All of this must be done with style as judges watch for the jumpers to perform gracefully. Judging takes place on take-off, soaring, distance, landing and distance. Long jumps are tough to control and the telemark position if more difficult. The quality of the landing can be the deciding factor if distances are equal for jumpers who have tied. Conditions prevalent at the start of the competition are important. Wind, temperature, snow type and humidity must be taken into consideration by the judges in determining the safe start bench. The jump ramp has various start ramps built in. Just how far the best jumpers may jump is the deciding factor. Fly a little too far and the skier would run out of landing slope. The normal hill individual competition is usually the first event in the schedule. This begins with the qualification event the day prior to the competition. The 15 top-ranked skiers from the world cup circuit are pre-qualified and do not have to take part in the qualification event. 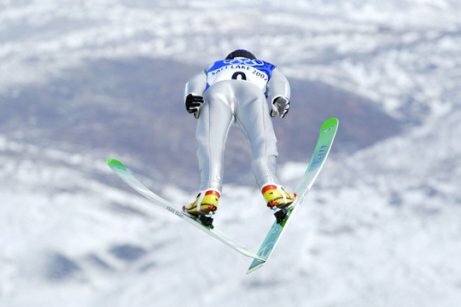 The remaining jumpers must be ranked in the top 35 skiers in the world to be able to participate. There are two rounds of jumps in the official competition. The first round consists of 50 starters and the top 35 move up to the final round. The second round starting order is reversed from the first with the best skiers going last. The large hill individual event follows the same format as the normal hill competition. It differs only in the size of the jumping ramp. Actually most of the World Cup skiing is done on the large hill with only two normal hill events carried out. Teams are made up of four jumpers. The compete in two rounds. In the first round one jumper from each team jumps, followed be the second, third and fourth skiers until all have finished the competition. The top eight teams compete in the second round. The starting order is reversed with the poorer jumpers going first and the best skiers last. The team that has achieved the highest score over all of the eight jumps is the winner. Alpine Skiing TechniquesA good website explaining Alpine skiing.